I thought it was about time I jumped on the surprise-inside cookie bandwagon. Sandra Denneler is the original creator of that fantastic pinata cookie idea (and so many more, for that matter)! Though Sandra contributes to a couple of popular sites, HERE is her home blog. 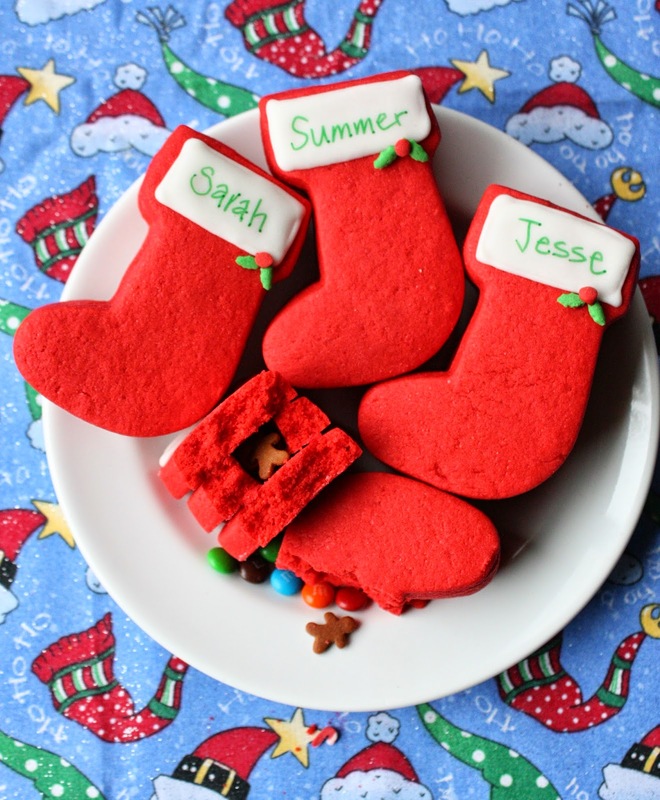 My stocking cookies are part of a Christmas Cookie Exchange, organized by Liz of Hoosier Homemade. I appreciate all of her hard work! 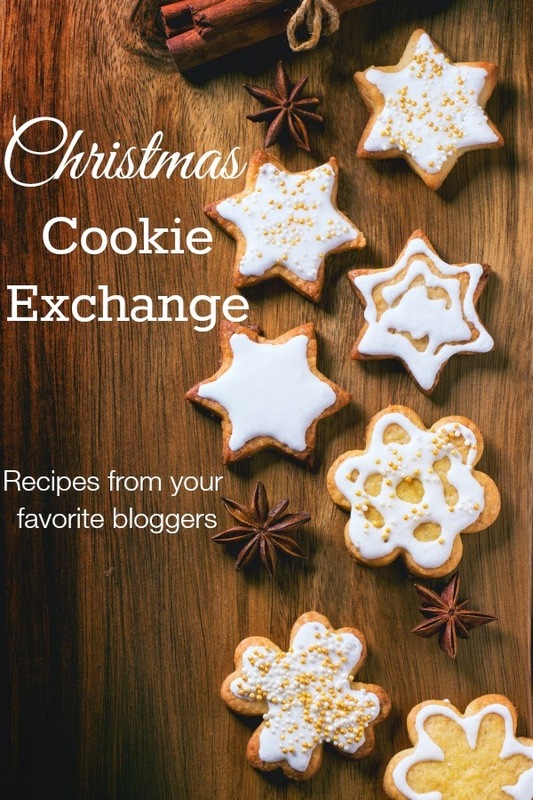 The Cookie exchange features 17 cookie recipes from 17 bloggers! Links and photo collage are at the end of this post. 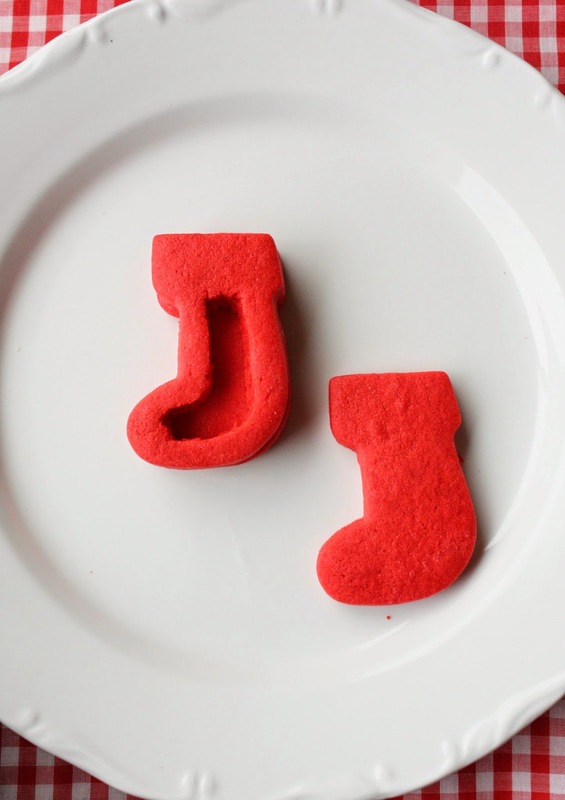 When the stocking cookies came out of the oven (before I bake the cookies, I place them, while on the baking sheet, in the freezer for 10-15 minutes to help them keep their shape), I used a small, sharp knife and cut out the treat cavities while the cookies were still warm. If you cut the opening beforehand, it may close up too much while baking, though I haven't tried it that way yet. I tinted the SUGAR COOKIE DOUGH (with "super red" AmeriColor gel paste) so that they'd be uniform, with the added bonus of coming together pretty quickly without royal icing drying time. Add red (or whatever matches, in case it shows) royal icing to the middle cookie and line it up on the bottom cookie, and gently press it on top. Fill the cookie with tiny treats! I used mini m&m candies, and threw in some Christmas sprinkles (candy canes and ginger men) for a festive appeal. Next, add royal icing around the inner edge of the middle cookie and place the last cookie on top. These would make great classroom treats or as place markers for Christmas dinner. Of course, you can modify these cookies for any other holiday being celebrated. HAVE FUN and enjoy the rest of the cookies! How completely adorable and clever! My daughter will love this recipe! I've yet to do surprise-inside cookies either but my kids would go NUTS over these!! Great job! I love these too. Well done, Sue. I love making surprise inside cookies and think Sandra is a genius for coming up with the idea. I love your stockings. They are a really the perfect shape to do for a surprise inside, because I'm always surprised to find what's hiding in my stocking. Love them!! So fun! The tiny sprinkles are adorable in there! These look amazing Sue! I love the colored dough. And what better place for a surprise than inside a stocking...none because it is perfect! Brilliant! What a wonderful collection of bloggers and recipes! As always, I love what you have done with the stocking cookies. It's always fun to find out what hidden inside, right? Cutest idea ever Sue. I think children would love getting a surprise. I've never seen this before. Just adorable, Sue! Love the addition of the sprinkles inside. Fun! These are beyond my imagination - cute, cute! I don't know if I have the patience, but I would love it if you shared these at Holiday Best at Tumbleweed Contessa.